Red Inn opened its doors in mid-2010 and it’s housed in a converted shop house. 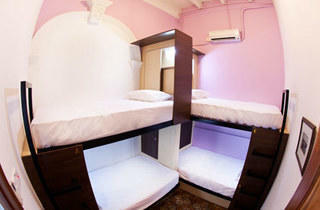 Only ten rooms are up for grabs and you’ll need to book ahead for their stylishly decorated but basic rooms. Dormitories are also available and there’s a great umbrella-shaded breakfast terrace to spend idle mornings or afternoons. Located in the heart of the island, dining, shopping, and a vibrant nightlife area are all within walking distance.